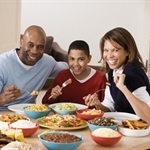 Admittedly, any “top family food” list will have a bit of bias based on personal preferences, but we have tried to honor certain criteria in selecting our 12 top family foods. We believe that the key to healthy eating is to fill your plate with foods that provide high quality nutrition, those foods which are most nutrient dense. This means foods that pack a lot of nutrition alongside relatively few fats and calories.